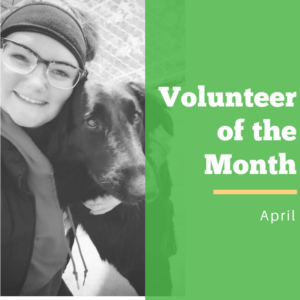 Deb has been a dedicated volunteer Dog Walker at HSSC since July of 2017. Convinced by her friend’s posts on social media, she made the decision to join after realizing that her service could make a difference in the lives of the dogs in our care. When asked what she loves about her role, she says she loves helping them relax in a stressful environment with snuggles and walks. As a new member of our Pet Promotions Committee, she now also gets to enjoy helping us get the word out about our animals through social media. Although every going home story pulls at her heartstrings (and with the many hours she serves, she’s seen a lot of those! ), Deb recalls seeing her sponsored boy Chango go home to his furever family as one of her fondest memories. Thank you, Deb, for your continued support and dedication! The Shelter is not just a place to adopt an animal or find a missing one, but a place to visit over and over again. This is your shelter, built by this community – a place to find happiness for animals and families alike.